Base layer is a type of underwear that made to maintain the comfort of the body. A specific property of such clothes is the ability to remove moisture, sweat of the skin and keep the heat. Best base layer is used not only in winter, but also in summer. The purpose of its use depends on the needs of the hunter. Most often hunters use it for extra winter protection. In terms of its properties, base layer is divided into heat-saving, moisture-releasing, and hybrid, allowing combining both of these properties. This list includes the best top and bottom layers for active hunters to ease the choice of it. Simultaneous lightness and density, complete protection from the cold and the ability for the body to breathe – this is only a few characteristic of a quality top base layer. Long sleeves provide absolute warmth than shirts. It can be easily worn by itself or under sweater. First Lite layering system offers the Llano that is the best next-to-skin layer for hunting activity. 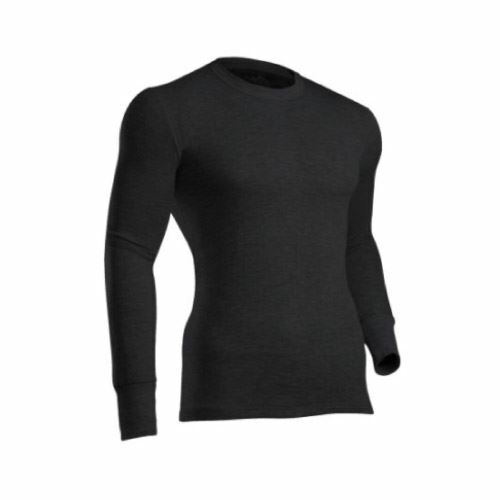 It’s made of 100% pure Merino Wool, that is comfortable for hot and cold temperatures. The wool is naturally antibacterial and helps to fight bacterial cells that cause unpleasant odor. It is also UV absorbent; it absorbs light and keeps you unnoticed instead of shining in the field. The Llano is truly great next-to-skin base layers. The base layer retains its odor resistant quality even when used for several days in a row. It keeps you comfortable from extremely high temperatures to the coldest as well. The layer eliminates shine and fire resistant. It is lightweight and there’s flat lock seams for next-to-skin comfort. Ergo cuff with thumb loops. Some claim that the durability of the material is not too good and it lasts only 1 season. This is a midweight version of the best-selling long sleeve base layers by Icebreaker that’s ideal for skiing, hiking and hunting in cold conditions, and for everyday winter layering. It regulates your body temperature. It features versatile wear and easy care. Moreover it is naturally odor free. Offset shoulder seams prevent pack rub. Forward set side seams are made for comfort. Flatlock seams prevent chafing. Drop tail hem for added coverage, Icebreaker tonal embroidered logo. The wool is not that soft as it is expected. 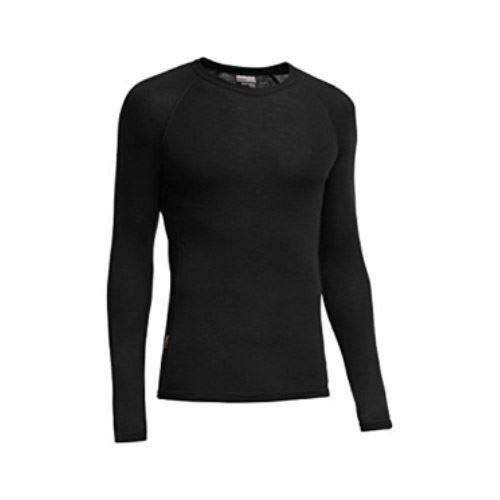 Wearing this 100% 18.5-micron Merino wool best base layer you feel comfortable all day without itch. It is a mid-weight long sleeve that is machine-washable and dryer-safe, so you can take care of it easily. It keeps you dry and comfortable in hot or cold weather. Manufacturer is going to meet all your demands and make sure you get a hassle-free refund, exchange, or replacement. Keeps you cool in summer and warm in winter thanks to 250g/m2 weight interlock-knit. Merino wool can be used as a base layer or mid-layer, it won’t weigh you down. It features natural wicking, anti-bacterial, and odor-resistant properties. Includes a 1-year limited manufacturer’s warranty, which covers manufacturing and material defects. The base layer may be too short and shrink with time. 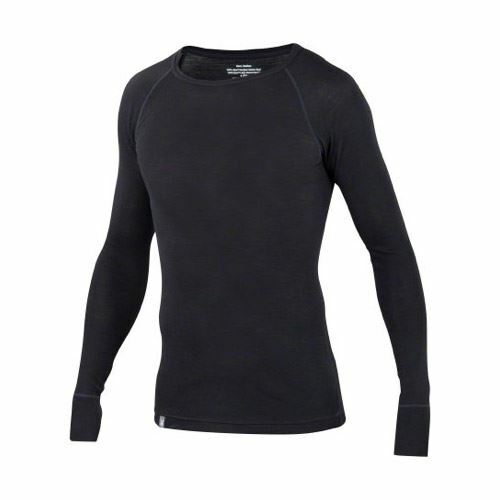 Ibex represents form fitting, lightweight Merino Wool base layer top. It is made of 100% New Zealand Merino wool, the lightweight Ibex Men’s Woolies 1 Crew is perfect for active, cool weather pursuits. It has natural anti-microbial properties and effectively manages moisture by pulling it away from the body to keep you warm, dry, and comfortable. Base layer has wide sleeve cuff detail. Flatlock seams help prevent chafing. Tag-free label for extreme comfort and reduced skin irritation. 100% Merino Wool that is moisture wicking and temperature regulating. The wool of this base layer is itchier than others. The material itself also a bit thin that leads to fast wear off. The men’s platinum II base layer is made with ColdPruf dual-layer insulation system that keeps the warm air inside the layers. The interior material is polyester and the exterior is a mix of polyester and Merino wool that provides great moisture wicking feature, fast drying and warmth. The antimicrobial technology provides durable, long lasting odor control. The Crew features a dropped tail and comfortable ribbed cuffs, flat lock seams and a specail design to prevent chaffing. ColdPruf provides quality materials. There is excellent sizing chart and sizes, especially for tall people. The layer doesn’t restrict your movements. The layer limits stinking while you sweat. Wool blend fights bacteria and polyester brings the moisture to the exterior layer. The seams may itch a little bit. The seam also may not stretch enough. The use of bottom base layer today has become a widespread – they are the first layer of clothing and remove moisture from the body. Manufacturers more often make bottoms from microfiber – a thin fiber of different cross-sections, which, woven into the fabric, forms high-density villi. Leggings not only remove moisture, but also warm you, because the moisture is not absorbed into the clothing, but is squeezed out. They can be worn in summer also as there’re materials of the layer, which allow the person’s skin to breathe, and the formed moisture quickly evaporates. Enjoy next-to-skin leggings without the squeeze. UA Base 4.0 delivers heat like no other, keeping you warm even in the extreme cold conditions. Soft, brushed negative grid interior traps hot air, providing superior warmth. It has performance elastic waistband. You can wear these leggings under your other pants for additional warmth or by themselves for better movement. Protect yourself from the cold when you have these leggings from Under Armour. 4-way stretch construction moves better in every direction. Material wicks sweat & dries really fast. Anti-odor technology prevents the growth of odor-causing microbes. 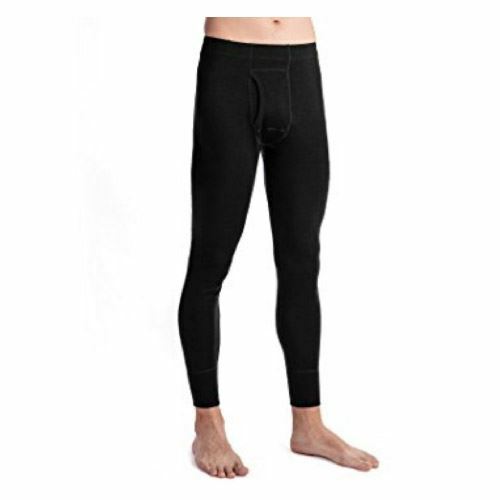 Meet men’s 250g/m² merino wool thermal leggings made of 100% all natural superfine 18.5-micron Merino wool. It’s absolutely non- itchy. These thermal pants are machine-washable on cold setting and safe to tumble dry on low heat with like colors. Leggings greatly suit for both cold and hot temperatures. These quick-drying pants feature a loop for hang. The material is natural wicking, anti-bacterial, and odor-resistant properties keep you dry and comfortable in hot or cold weather. They are breathable and absorb moisture. It may change its size after the first wash. The waistband isn’t much stretchy. 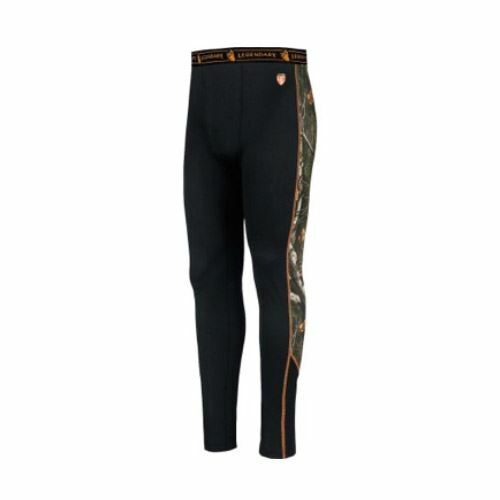 Robinson Scent Blocker Pants should be what you are looking for as the base layer for hunting. 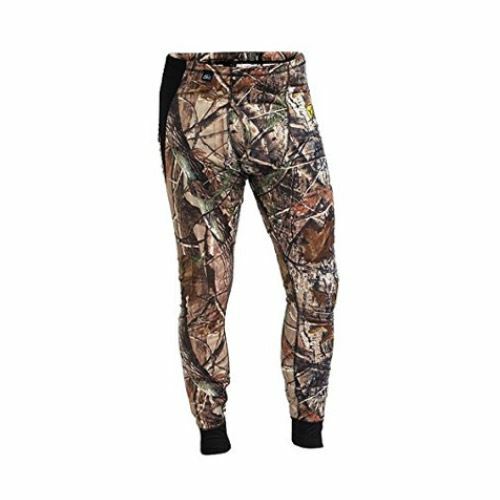 These bottoms are meant to be a true base layer that does a great job of insulating when sitting for hours glassing or in the tree stand but breathe also well. These pants are also treated with the Scent Blocker formula resulting in excellent scent protection. This is a lightweight base layer that is the ideal choice for next-to-skin performance, cool, light anti-microbial polyester jersey, boxer style front fly, elasticized waistband. These pants may be a bit larger in size. 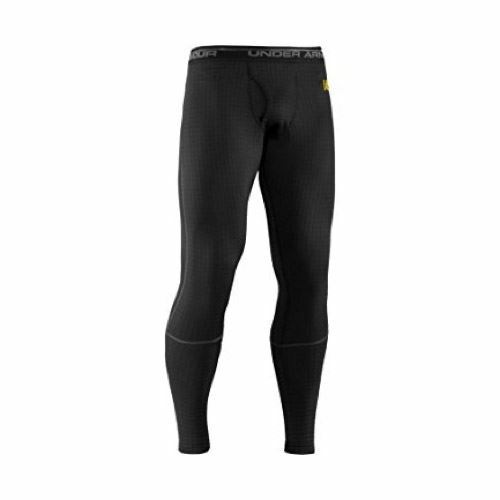 Men’s platinum II base layer pant is engineered with ColdPruf dual-layer insulation system that traps warm air between the best base layers. The interior material is ColdPruf technical fiber performance polyester and the exterior is a polyester/Merino wool blend that delivers superior moisture feature, rapid drying and warmth. Antimicrobial technology provides durable, long lasting odor control on the fabric. The pants feature a comfort waistband, a darted fly and a wide back GUSSET that follow a man’s natural shape and ensure the pants stay in place. Two-layer engineering traps air between layers provides a natural barrier of warmth. 100% ColdPruf Technical Fiber Polyester with SILVADUR Intelligent Freshness. The pants feature a dropped tail and comfort ribbed cuffs and have flat seams and a tangles design to prevent chaffing. The pants fit snug in the ankle area and don’t seem to be enough stretchy. These pants feature Nanotec antimicrobial scent protection. It has moisture-wicking 100% poly interlock stretch lightweight knit. It’s great for hunting as there’s Big Game 360 Camo patterns and wide comfortable elastic Signature Buck waistband. The quality and performance of these pants are high that only provided by Legendary! Wear them for hunting and every day! The pants feature comfortable interlock stretch knit and wide elastic waistband. Permanent antimicrobial technology and moisture-wicking keep you dry in any activity. There’s smooth comfortable flat lock and cover stitching. They may be short and you have to pull them up every time you move. Base layer is functional underwear, the main purpose of which is to keep heat and drain the moisture from the skin of the body. The air contained in the best base layer, contacts with the body, and heats it to a comfortable temperature. Thus, a protective layer of warm air is created between the skin and the cold external environment, the effect of keeping heat is obtained. With physical activity, the human skin produces moisture (sweat), which, accumulating in the fabric of ordinary linen, reduces its thermal insulation properties. The heating and evaporation of this moisture consumes additional energy. Base layer is great for different activities, particularly for hunting. 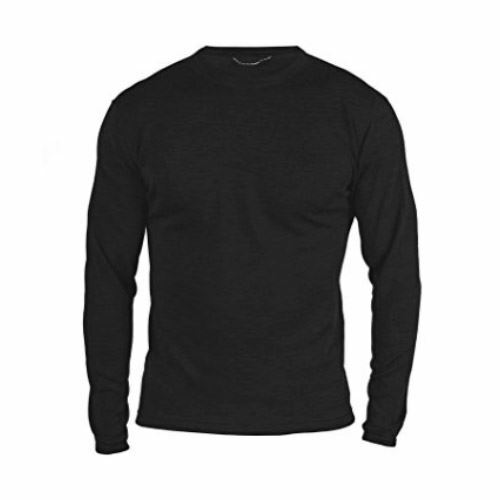 Base layer can be made of polyester, polypropylene, wool, cotton or a combination of them, etc. Completely synthetic materials are better suited for moisture, and they are more durable. Cotton or wool makes the layer more comfortable, which is more suitable for everyday use. Base layer with the addition of wool is the warmest. The most famous property of wool is the ability to save the heat. This is due to the fact that the wool can, due to the composition of its fiber, bind a lot of heat and keep it between the fibers. If you are cold in the winter and cannot find anything comfortable, this is exactly what you need! It’s light, soft and comfortable layer, which will not only drain moisture, but also warm you in cold weather. It is intended for a temperature of -5 °/ -30 °C. Wool is found in the base layers of well-known manufacturers such as Norver, Odlo, Craft and others. there is a chance that after washing it can change the size. Base layers made of 100% synthetics provide the major function – moisture retention. Fabrics made from natural fibers absorb sweat into themselves. Wet, heavy clothing sticks to the body, complicates movement and cools the body. Layers from synthetics will never lead you to this. It is intended for a temperature from + 10 ° to -25 °C. ease of washing and care. synthetic fibers can based on petroleum products. 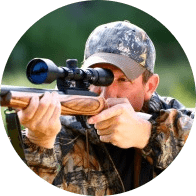 By the structure, cotton consists of a multitude of microfibers twisted together, which makes the best base layer for hunting pleasant to the skin and well-fitting. Cotton excellently absorbs moisture, removing it from the body. Such layer, 100% made of cotton, is recommended for daily wear and such activity as hunting. High strength and durability imparts silk to the layer. In addition, silk is pleasant to the touch and comfortable for the body. For the manufacture of the base layer, silk is used in combination with synthetics. silk fabric is resistant to rot and to the formation of various fungi or mold. under the influence of moisture on the silk can appear ugly spots. To get rid of the moisture helps thin synthetic base layers made of polyester, elastane or polypropylene for wearing with high physical activity in cold and rainy weather and in summer heat. Completely synthetic materials are better suited for absorbing moisture and more durable. To preserve heat and remove excess moisture from the skin manufacturers use a large thickness of fabric, a certain combination of materials, a multi-layered structure of the base layer. The inner layer is responsible for draining moisture, and the outer layer is responsible for keeping heat and sometimes, absorbing the excreted sweat. There are models with a special bacterial impregnation, which helps to destroy the smell of sweat, formed as a result of the multiplication of bacteria. But such impregnation doesn’t have long effect, as it is washed off after a few washings. To get rid of unpleasant odors due to the prolonged wear, modern manufacturers use antibacterial treatment. Also for the purpose of maintaining skin’s hygiene, Meryl Skinlife bacteriostatic fiber is used, and the X-Static nylon thread, which is coated with a layer of silver, is used to suppress the reproduction of bacteria and fungi. To choose a suitable best base layer should be considered according to its necessity and type of activity. Manufacturers produce models taking into account the differentiation of physical loads and weather conditions. It is mandatory to choose the right clothes according to the size; otherwise the effectiveness of its use will be decreased. If you’re going to hunt in winter it is better to choose a synthetic single-layer or two-layer base layer. Since hunter spend a lot of time in the field or wood, without a movement, it’s better to give preference to base layer made of wool. 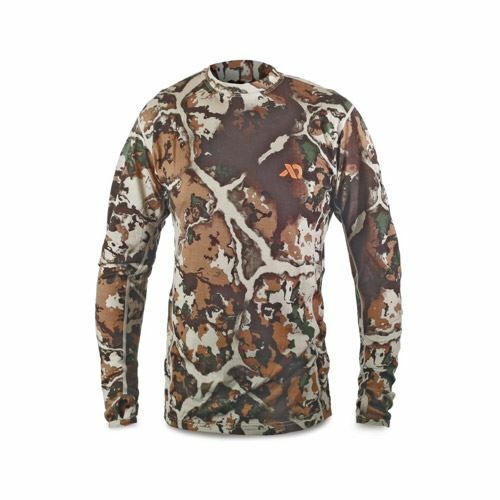 If you hunt in spring or fall then cotton base layer is a good choice. The last thing you need to remember is that the main function of base layer is to remove moisture and provide warmth and comfort. Choose it depending on the rhythm of hunting activity and the need for its use.